Sometimes, you can make improvements to an image on your HTML5 and CSS3 web page by modifying the colors with IrfanView. The Color corrections dialog box on the Images menu gives you a wide range of options. Brightness: When adjusted to a higher value, the image becomes closer to white. When adjusted to a negative value, the image becomes closer to black. This is useful when you want to make an image lighter or darker for use as a background image. If your image is too dark or too bright, you may be tempted to use the Brightness feature to fix it. The Gamma Correction feature is more useful for this task. Contrast: You usually use the Contrast feature in conjunction with the Brightness feature to adjust an image. Sometimes, an image can be improved with small amounts of contrast adjustments. Color Balance: Sometimes, an image has poor color balance (for example, indoor lighting sometimes creates a bluish cast). You can adjust the amount of red, green, and blue with a series of sliders. The easiest way to manage color balance is to look at a part of the image that’s supposed to be white and play with the slider until it looks truly white. Gamma Correction: This is used to correct an image that is too dark or too light. 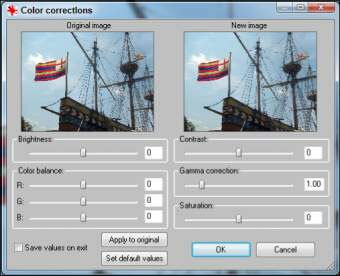 Unlike the Brightness adjustment, Gamma Correction automatically adjusts the contrast. Small adjustments to this slider can sometimes fix images that are a little too dark or too light. Saturation: When saturation is at its smallest value, the image becomes black and white. At its largest value, the colors are enhanced. Use this control to create a grayscale image or to enhance colors for artistic effect.